Harrisburg is the capital city of Pennsylvania. Founded by Englishman John Harris in the late 1700s, Harrisburg soon grew to be a leading trade and transportation hub in the area. It became the capital of Pennsylvania in 1812, and continued to grow into a center for local agriculture and industry. 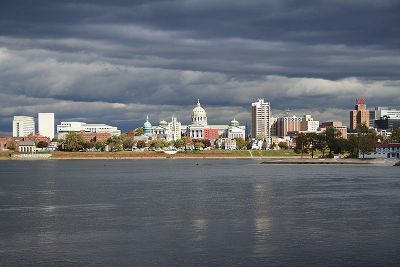 Although the city suffered a social decline in the 1970s and 1980s, large revitalization efforts throughout the 1990s helped Harrisburg save its reputation and turn it from one of the most distressed cities in the country to one of the most desirable destinations in Pennsylvania. Harrisburg's downtown is not only a booming center for business, but also the place to go for entertainment in the region, with numerous restaurants, galleries, and museums. The city is located on the Susquehanna River in the "south-central" area of the state. In 2011, Harrisburg had a population of 49,673. In 2010 Forbes Magazine rated Harrisburg second in the top 10 places to raise a family. ↑ Harrisburg (city) QuickFacts from the US Census Bureau. Retrieved on September 25, 2012. ↑ Levy, Francesca. "America's Best Places to Raise a Family", Forbes.com, June 7, 2010. Retrieved on September 25, 2012. This page was last modified on 9 April 2019, at 09:45. This page has been accessed 3,864 times.